Many new build basements are constructed these days and a large number of these are waterproofed from the outside (and underneath) as part of the construction process. Since the judgement given by The Outwing Case in 1999, it has become a standard minimum for two layers of protection to be installed to the exterior of a new build basement working in tandem with appropriate land drainage; more specifically with the land drains in the correct position in the ground. In recent years it has become more prevalent for insurance companies to insist on three layers of protection. However, more practically, sometimes a full system outside may not be possible due to site and ground conditions. This could be down to geology or even the encroachment of existing buildings, the reasons can be myriad and complicated. As we have said before, many times on this web site, the cavity drain system is extremely versatile because it can go over any structurally sound substrate. Whether it's old brick, plaster, block-work, concrete, stone; or any mixed-bag combination thereof, it will do the job. The only Achilles heel with this system is that the ability to drain off water must be assured. Please note: Cavity Drain Systems do not cope well with water under pressure, they are designed to take water pressure away - as they are 'unstressed' this is another reason why they can be so long-lived if installed correctly. So to that end, we mean that either good and reliable land drainage, using gravity to take any water ingress to a 'sustainably' lower level must exist on site or; you need to install a pumped system that will evacuate any water ingress into the basement to a nearby drain or designed soak-away. This sounds like the perfect approach every time but unfortunately this can cause another headache in some cases. Many new build basements have floor slabs that are designed to form part of the structural integrity of the entire building above, and as such they often cannot be cut into to install the channeling required to make a cavity drain tanking system work. Re-working the slab design may not always be feasible, especially if it is already built! So if you have an 'uncuttable' slab and mixed construction around the basement, what do you do? Well it may be possible to still use a cavity drain system in a slightly different but equally effective way. Please see the diagram above for a basic overview of one possible way of achieving this, clicking the image will enlarge it. If drainage by gravity can be achieved, depending upon site conditions of course, then the slab need not be altered. If this is not the case, a small alteration in the slab may be required to allow for the installation of a sump chamber, but this is a far smaller adjustment than cutting for perimeter drainage. This version of the standard cavity drain system, as the diagram shows, allows installation to take place above-slab. It must be stressed that this system should only be used in conjunction with a closed-cell, fully waterproof insulation board - there are several such boards on the market. As with all similar systems, the wall membrane, in this case Oldroyd Xv Clear, is fitted first. Then by using the Oldroyd Xv20 Membrane as a base, this allows far greater water dispersal thanks to the Xv20's 20mm ground clearance. The channels are placed where required, usually around the perimeter, but flat channels (without the high sides) can also be incorporated across the basement if the span is large. 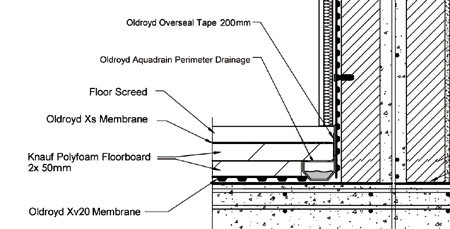 The vast majority of the water will never pass above the Xv20 layer if the floors are level but should extreme water ingress occur, the closed cell insulation will be unaffected and the system is topped with Oldroyd Xs Slim-line Membrane to seal everything up and provide a generous covering at the floor/wall junction where all the membranes and channel meet. All membranes are sealed with Oldroyd Double Sided and Over-seal Tapes and the system is ready to be covered by a screed or a floating floor system, for example. We have found that, in practice, a wet screed system can get everywhere and you don't want it floating your insulation away! We have so far managed to avoid this predicament by covering the whole system with a 'one-piece', or as near as you can get it, Visqueen type DPM with any unavoidable joints securely taped. 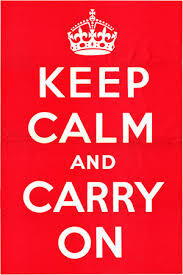 We respectfully suggest that this is a very cheap and prudent way of avoiding a nightmare! This version of the standard Cavity Drain System can be a very simple and reliable solution to a very problematic scenario!